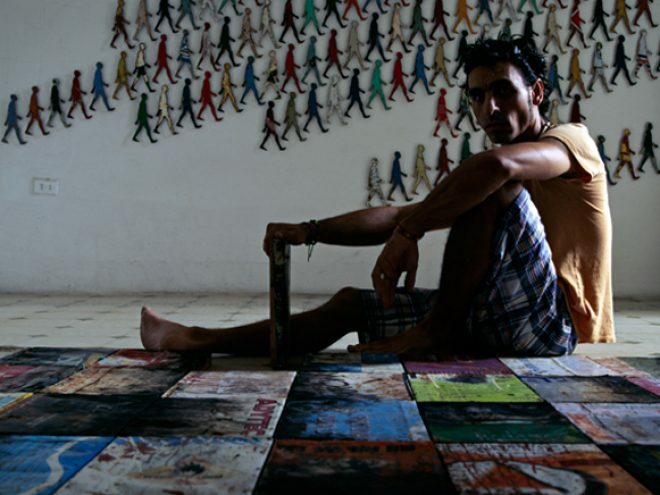 Damián Aquiles divides his time between his gallery/home at Calle 25 No. 1012 entre 2 y 4 in the residential area of El Vedado in the capital, surrounded by formerly elegant bourgeois mansions, and his workshop/home in Jaruco, a peaceful town approximately 50 km from Havana. Damián has one obsession: working. And he does it as if, at 36, he had only a few more years to live. This is why you will not normally find him at gatherings, soirées, cocktail parties or any other of the usual events of Havana’s intellectual and artistic world. Damián has also worked extensively with brass formed by squares of scrap material, perfectly flattened, marked by its creator, and grouped according to an impeccable arrangement not in any way foreign to the design studies Damián took from 1992 to 1996, and which are inevitably reminiscent of Theo van Doesburg’s conception and Piet Mondrian’s view that art is the creation of elementary relations. More recently Damián has used a combination of techniques (especially collages and drippings) on canvas to produce abstract work with a strong emotional impact. His use of scrawling—free motions of writing or an imperfect imitation of automatic writing—and, in particular, graffiti, with key words, force the viewer to connote the emotional impact in the direction that the artist is interested in.